A person with hypertension told me that she feels better after eating a banana or drinking coconut water. This is the potassium effect! High sodium intake may lead to hypertension. A reduction helps lower BP in hypertensives. But not many hypertensives know that potassium in foods helps in lowering BP. 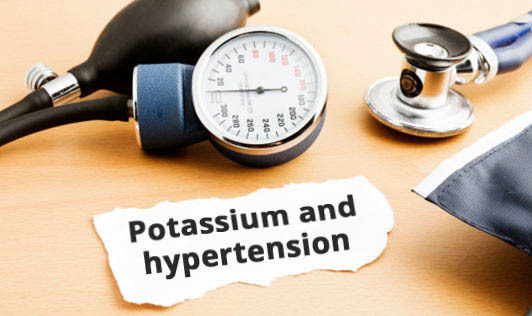 Potassium is involved in nerve function, muscle control and blood pressure. Eating equal amounts of sodium and potassium daily might be beneficial in controlling BP. Potassium works with sodium to maintain the body's water balance. Increased potassium intake may increase the amount of sodium excreted from the body. Ensuring an adequate amount of calcium and magnesium in the diet is important to protect against high BP and general health. The exact requirement for potassium is not yet known but approximate intake of 2000 mg per day should be beneficial. Athletes involved in prolonged exercise may require about 3 times more in order to replace the potassium lost from muscle. One cup of orange juice, a banana or a potato is sufficient to replace the potassium lost during one to two hours of exercise. Potassium is naturally present in many foods. Among cereals, ragi and bajra are high in potassium. Lobia, moong dal and turdal are high potassium pulses. In the vegetable group, colocasia, amaranth, drumstick, coriander leaves, sweet potato and yam are high in potassium. Gooseberry, apricot, banana, mango, peach, plum, chickoo, custard apple and musambi are high potassium fruits. Coconut water is a good source of potassium. There can be an imbalance in sodium - potassium ratio when you take a lot of processed, ready-to-eat foods. Sodium is added to most highly processed foods, but potassium is not. Eating more fresh foods, which are usually lower in sodium and contain natural potassium, is healthier than eating processed and packaged foods. Natural foods, especially fruits and veggies will make sure that your blood pressure is under control.